Spencer Lang in action over the weekend. The Butler men’s tennis team ended the regular season with a 20-6 record. Photo by Jimmy Lafakis. The last weekend of regular season play ended in a rough outing for the Butler women’s tennis team, along with close call victories for the men’s tennis team. The conference matchups were key in diagnosing where each team stands headed into the Big East tournament. The women started the weekend with a matchup against Xavier on Friday, April 12, but ultimately were shut out by the Musketeers. Senior Carla O’Byrne played her final match at the Butler Bubble in a doubles set alongside Sara Linn, but fell 2-6. In singles play, Linn put on a good showing in the No. 1 spot, yet could not grab a victory after losing 6-3, 6-1. The struggles would continue throughout singles play and the Bulldogs fell to Xavier 7-0. They finished the regular season with a 11-13 overall record, their best since the 2010-11 season. In Big East play, the women finished 1-6. The men had a pair of tough matches against Marquette and DePaul the following two days. Against the Golden Eagles, the Bulldogs split the first two sets in the doubles point, forcing the decision to come down to the matchup on the No. 2 court. Marquette would eventually win, despite great effort by Aviv Ben Shabat and Adrian Mag. 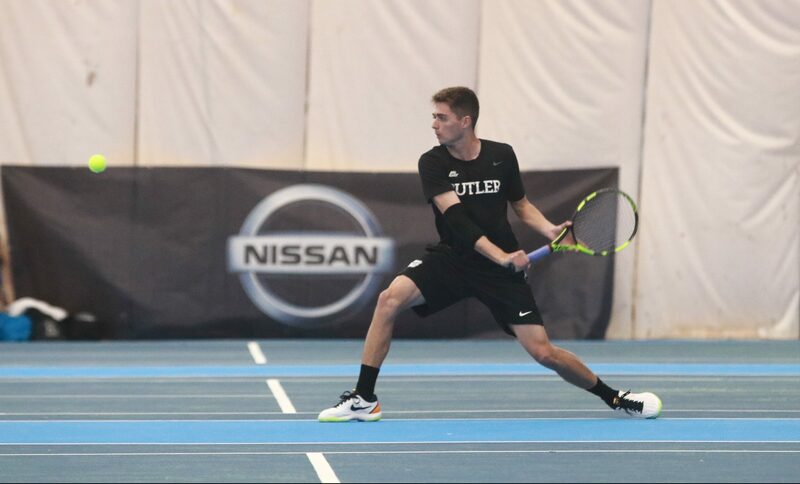 When they went to singles play, Butler found themselves trailing 2-0 after dropping matches on courts 3 and 4. But a pair of three set victories would begin the Bulldog rally. Thomas Brennan won the first and third set in his matchup, followed by another by Michael Dickson. To tie things at three apiece, Spencer Lang came back and won his match in three sets 6-7, 6-4, 6-1. It came down to Mason Dragos. After losing the first set 6-7, he was able to win the final two sets of his game 6-4, 7-5, sealing the Bulldog victory 4-3. Butler would need to put in a good showing yet again the next day against DePaul, and it took a lot of work yet again. After failing to grab the doubles point and losing the first match on court 4, the Bulldogs were behind 0-2. Ben Shabat won his singles match 6-4, 6-2, bringing Butler within one point, but a Dragos loss extended the Blue Demons lead. The Bulldogs pulled even at three thanks to victories by Brennan and Lang. With the match on the line yet again, Mag won his matchup in three sets, 6-4, 1-6, 6-1, clinching the Senior Day victory 4-3. The men finish the regular season 20-6, with a 4-1 Big East record. They carry a five-match winning streak heading into the Big East tournament.